A Caribbean cruise is a dream vacation for many travelers. However, when these travelers start planning their cruise, it is difficult to decide which ports of call to visit in the region. Since most cruises sail to either the Eastern Caribbean or the Western Caribbean, the big question soon becomes which is better, an Eastern Caribbean cruise or Western Caribbean cruise? The short answer is that you can have a great vacation at either destination, but there are differences in the ports of call. This article describes things to do and see at the best cruise ports in the Western Caribbean, which includes the islands west and south of Cuba, along with Mexico, Central America, and Colombia in South America. The good news for cruise travelers is that their cruise ship will most likely have a shore excursion option to participate in the best local activities or see the most interesting historical sites in these ports of call. Alternatively, ships usually dock near a town and/or beach, so those who like to explore on their own can go shopping or enjoy the great beaches and other sites of the Western Caribbean near their ship. Cruise ships have three great Western Caribbean ports of call on the eastern coast and Yucatan Peninsula of Mexico. One of the ports, Progreso, is in the Yucatan state of Mexico. The island of Cozumel and Costa Maya, which is about a four-hour drive from Cancun, are located in the Mexican state of Quintana Roo. Cozumel is an island about 12 miles from Playa del Carmen near the southern tip of the Yucatan Peninsula of Mexico. Cozumel is only about 30 miles long and 10 miles wide​ but offers diverse activities for visitors. Unsurprisingly, many of these activities are in or on the water, with great beaches, diving, and snorkeling spots. Cozumel also offers history buffs the opportunity to explore the ancient Mayan site of San Gervasio, which is the only archaeological site on Cozumel. However, Cozumel is just a short ferry ride from Playa del Carmen, which has many excellent Mayan sites nearby like Tulum. Those who like to shop will enjoy exploring all of the shops near the cruise ship pier or they can take a cab or shuttle into the town of San Miguel near the center of the island. If you love dolphins and want to splurge a little, plan a visit to Dolphinaris, where you can feed and/or swim with the dolphins. Progreso is on the northern side of the Yucatan Peninsula of Mexico, only about 30 miles from Merida. The port is very distinctive because of its pier, which reaches about 4 miles out into the sea. Completed in 1989, it's the world's longest pier. Fortunately for cruise visitors, a free shuttle will take them into town. Progreso is one of the newer cruise ports in Mexico, and ships offer dozens of great shore excursions. Visitors who appreciate Mayan history can visit the archaeological sites of Dzibilchaltun, Uxmal, or ​Chichen Itza, which was voted one of the New 7 Wonders of the World, and the only one in North America. Other shore excursion activities include cave snorkeling, golfing, hiking, fishing, paddle boarding, riding in a beach buggy, or exploring a cave. Since the town of Merida is nearby, visitors can easily learn more about the history and culture of the region. Costa Maya is also on the Yucatan Peninsula of Mexico, but about 100 miles further down the Peninsula from Playa del Carmen. It's near the border of Mexico and Belize. This region of Mexico is not as developed as other Mexican ports of call, but it does have pristine beaches and spectacular Mayan ruins hidden in the nearby jungle. These ruins are not as over-visited as others in Mexico, which makes them even more fascinating. Many cruise passengers specifically want to visit Chacchoben, an ancient city dating back to the 4th century A.D. The Costa Maya area also features many different types of birds, monkeys, and even jaguars in its jungle setting. Those who enjoy more active fun will enjoy water sports, biking, snorkeling, and paddle boarding. The Costa Maya village and cruise facility are in the small town of Mahahual in the southern corner of the Mexican state of Quintana Roo. This village was purpose-built to attract cruise ships back in 2001 and significantly renovated after a hurricane in 2007. Cruise travelers will love the numerous shops, bars, and restaurants near the pier, and it's an inexpensive taxi ride into the shopping district of the town of Mahahual. Most cruise lines will have Costa Maya shore excursions similar to those of Royal Caribbean and Carnival Cruise Lines. Although cruise ships have to tender passengers ashore at Grand Cayman Island, it's still one of the most popular cruise ports in the Caribbean. Grand Cayman has many features that cruise travelers love — great shopping, spectacular beaches, and fun bars. The flat island also has unique places to visit like Stingray City, the turtle farm, and Hell. Stingray City is a sandbar where stingrays come to be fed. Small boats take vacationers and cruise travelers out to the sandbar and you can snorkel, SCUBA, feed the stingrays by hand, or just watch them in the crystal clear water. The turtle farm on Grand Cayman has all sorts of sea turtles and provides an opportunity for kids (and adults) to learn more about sea turtles. Hell is a small village that sits in the middle of a rocky outcropping that looks almost burned (like Hell). People come to buy postcards and t-shirts and have their photo taken by the "Hell" sign. Even with all these unique places to see, most cruise travelers head to one of the Grand Cayman beaches (Seven Mile Beach is very popular) to swim or sit on the white sand and have a cold drink. Jamaica is a large island in the Western Caribbean with three popular cruise ports on the north coast — Montego Bay, Falmouth, and Ocho Rios. All the ports in Jamaica seem to have aggressive vendors, but ignoring them and just saying "no thank you" usually works. Many travelers consider Montego Bay the island's capital of tourism. It is Jamaica's second largest city and is famous for its lively atmosphere, great duty-free shopping, and luxurious golf and beach resorts. Although some of the best beaches are for resort guests only, cruise passengers can enjoy Doctor's Cave Beach or take an excursion to the famous Seven Mile Beach in Negril (less than 2 hours away). Montego Bay has some fascinating historic plantation homes, called Great Houses, that are open to tourists. Visitors can also arrange tours to popular sites near other Jamaican ports like Dunn's River Falls, which is closest to the port of Ocho Rios. Falmouth is a small town of about 10,000 residents on the northern coast of Jamaica about 18 miles east of Montego Bay. Its most famous citizen is Usain Bolt, who is an Olympic champion and world-record sprinter. This historic town with its Georgian-style architecture became well-known to cruise travelers when Royal Caribbean completed its $200 million Falmouth Cruise Terminal in 2011. Since the terminal has pier space for two large cruise ships, its population almost doubles when two ships are in port. The cruise terminal has enough bars, restaurants, and shopping to keep most visitors happy. Although many visitors never venture outside the terminal area, cruise ships offer excursions that feature Jamaica's history, culture, or natural wonders. The town of Falmouth provides some good local color and handicrafts for those who want to experience the real Jamaica. Ocho Rios is Jamaica's third cruise ship port of call. 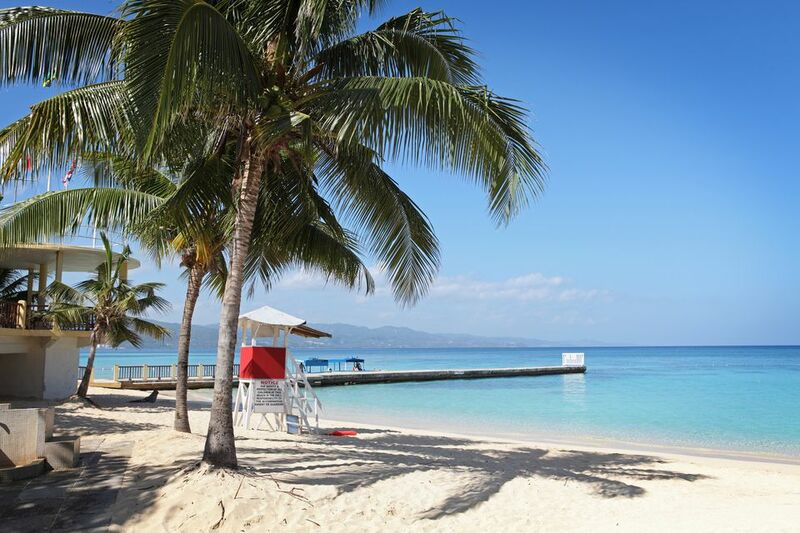 Also located on the north shore of the island, Ocho Rios is about 48 miles from Montego Bay and 30 miles from Falmouth. Like other Jamaican ports, Ocho Rios offers plenty of shopping, eating, and drinking venues, but many visitors take a ship's shore excursion to one of the three popular sites nearby — Dunn's River Falls, Mystic Mountain, or James Bond beach. Ocho Rios has many waterfalls in the surrounding mountains and jungle, but Dunn's River Falls is the one most people want to visit and climb the many terraces that stretch 600 feet up. Be sure to wear water shoes as the rocks are difficult to walk on and slippery. Mystic Mountain is also near Ocho Rios and offers many activities (for a fee) like zip lines, bobsledding, or a chairlift canopy tour over the rainforest. Great fun for those looking for some adventure. The James Bond beach is a 20-minute drive from Ocho Rios, and the beach got its name because of its proximity to Goldeneye, the villa where Ian Fleming wrote many of the James Bond novels. In addition to Mexico and the islands of the Western Caribbean, Central and South America are also visited by cruise ships on their itineraries. Belize City is the largest city in the Central American country of Belize, which was called British Honduras until 1973 and gained its independence from Great Britain in 1981. Belize City doesn't have as much shopping as other Western Caribbean ports, but cruise ships have terrific shore excursions inland like tubing in a river inside a cave and zip lining over the jungle. Other popular activities focus on the fascinating, diverse culture of Belize, visiting ancient Mayan sites, hiking in the jungle, canoeing, kayaking, or visiting a museum or wildlife sanctuary. Harvest Caye is Norwegian Cruise Line's private resort on the coast of Belize. Unlike Belize City, which requires tendering ashore, cruise ships can dock at Harvest Caye. The 75-acre resort has a huge swimming pool, beach with cabanas, canoeing, kayaking, ​zip lining, parasailing, and paddle boarding. Harvest Caye also has some nice retail shops. Many cruise guests whose ships stopover at Harvest Caye will spend their time enjoying the resort's activities. However, those who want to explore more of Belize can take shore excursions that include river tubing in a rainforest, exploring mangrove lagoons, or visiting Mayan archaeological sites. Honduras is south of Belize and Roatan is the most developed of all the Bay Islands of Honduras. Cruise ships dock either in the capital of Coxen Hole or nearby Mahogany Bay. Both these cruise terminals have plenty of shops and things to do within walking distance, but many visitors want to go snorkeling or diving on the huge reef that the Bay Islands are deservedly famous for. Like other Caribbean islands, Roatan has a fascinating history and local culture, so cruise guests who don't like the beach might want to book a tour that provides an overview of historical Roatan. Another option is to take a small boat to explore the mangrove forests, which are filled with wildlife. Cartagena, Colombia is the only Western Caribbean port in South America. With almost one million residents, it's quite different than the other Western Caribbean stopovers for cruise ships. Sailing into the city is quite beautiful, so be sure to be out on the deck. Most tours in Cartagena focus on the old town historical sites or the Castillo de San Felipe de Barajas, which is a fortress started in the 16th century that took over 150 years to complete. Those who want to go to a South American beach can find several lovely ones near the city. Travelers who love their jewelry will know that Colombia gems (especially emeralds) are famous. It's not surprising that the city has many jewelry stores. One other fun place to shop in Cartagena is the Las Bovedas shops, which are 23 dungeons built in the 18th century that used to hold prisoners. Today these dungeons are shops holding souvenirs. Although the Panama Canal is a destination in itself, Panama has ports of call on both the Western Caribbean and the Pacific Oceans. Many Western Caribbean cruises have partial transits of the Panama Canal that include the Gatun Lock which links Lake Gatun with the Caribbean Sea. Colon, Panama is the Panamanian port of call on the Caribbean and Panama's second largest city. Colon doesn't have as many attractions as Cartagena, but most cruise passengers do not have a long time in the city. After all, they've come to Panama to see the Panama Canal. For those with more time, Panama has some beautiful beaches in the Caribbean with bird watching, diving, and snorkeling. Those who love history should spend a few hours exploring the ruins at Fort San Lorenzo, a 16th-century fort that overlooks the Chagres River. Most tours of Costa Rica ​will focus on the interior or the magnificent beaches on the Pacific side. However, the Caribbean coast of Costa Rica is filled with exotic wildlife (like sloths) and the main port of call is at Puerto Limon. Puerto Limon is off the beaten path from other towns in Costa Rica, but cruise travelers who love exploring the great outdoors will love the rainforest and trails at Braulio Carillo National Park and the waterfalls, exotic wildlife, and spectacular scenery of Veragua Rainforest Park near Puerto Limon. Many of us are partial to sloths, and the Limon province even has a sloth sanctuary, where you can learn everything you wanted to know about these fascinating creatures. Most cruise cities in the USA are primarily for embarking and disembarking passengers. However, one popular port of call for ships sailing the Western Caribbean is Key West, Florida. It's the southernmost point in the continental United States and has its own special flavor, with a fascinating history, bars, and one of the world's best sunsets (according to their brochures). Key West is a unique city with its lovely old residences in the historic district, the home of Ernest Hemingway (with its six-toed cats), and President Truman's Little White House. Many ships dock right at Mallory Square, and those with balcony cabins overlooking the pier can watch tourists and locals gather in the square to watch the sunset. The sunsets at Mallory Square are often magnificent, but those on cruise ships are treated to great sunsets almost every evening. What Are Some Cruise Itineraries Heading to the Caribbean?